Patricia A. Hummell, 70, of Palmer Township, Pa passed away on Sunday, July 6, 2008 in Lehigh Valley Hospital-Muhlenburg surrounded by her loving family. On April 11, 1938 in Easton, Pa, she was the daughter of the late Edward and Marie Goth McInerney. Patricia and her husband Henry J., celebrated their 42nd wedding anniversary on May 28, 2008. She was a loving wife, mother, grandmother, and sister. Membership: Patricia was a member of St. Jane Frances de Chantal Catholic Church. 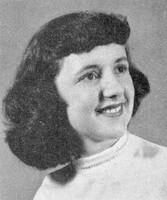 Survivors: In addition to her husband, Henry, Patricia is survived by two sons, Robert W. Eschenbach, Jr. and his wife, Jeanmarie of Harleysville, and Henry J. Hummell, Jr. and his wife, Julie of Macungie; three daughters, Kathleen M. Wilson and her husband, Kevin of Forks Township, Margaret L. Bova and her husband James of Macungie, and Melissa M. Greiser and her husband, Jim of Souderton; a brother, Edward McInerney, Jr. of Palmer Township, and nine grandchildren, Shannon Wilson, Grace, Audrey, Evan, and Patrick Bova, Jimmy, Joey, and Kyle Greiser, and Natalie Hummell.Services: Will be held Thursday at 9:30 a.m. in the Strunk Funeral Home, Inc., 2101 Northampton St., Wilson Borough, Pa followed by a Mass of Christan Burial at 10 a.m. in the church, 4049 Hartley Ave., Palmer Township. Calling hours will be on Wednesday from 6 to 8 p.m. in the funeral home. Burial will be in St. Joseph’s New Cemetery.